Just when you think they’ve settled into a niche, Bows and Arrows comes up with something new. How adorable is this? 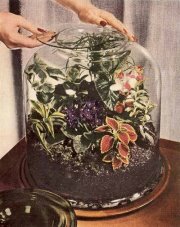 They’re hosting a workshop on November 5th on how to make your own terrarium. It’s only $40 and all supplies are included. Perfect for us studio apartment dwellers who are having outdoor withdrawals. 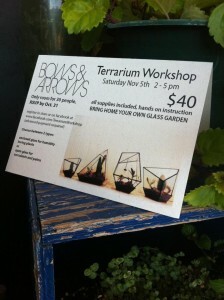 To RSVP, go to this facebook page http://www.facebook.com/TerrariumWorkshop.